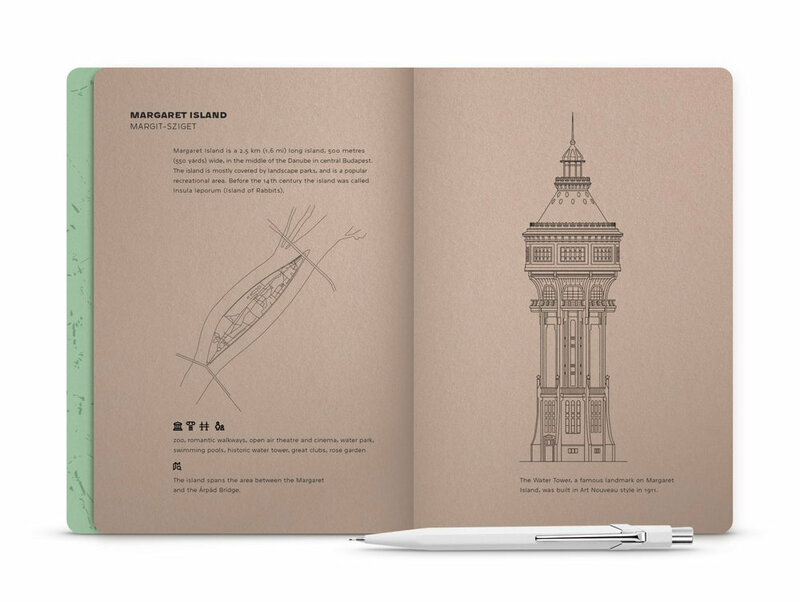 Illustrated eco-design notebook with iconic sights of Budapest. We know that you are in a hurry so let the notebook introduce itself in half a minute. During the design and production, our goal was to create a well-used, exciting, contemporary, demanding and eco-design product. Your sketches, drawings and ideas love grid layouts that are subtle and can help you. Extra high quality cover and note paper for extra high user experience. Don’t worry about the trees. All the paper used come from sustainable sources. Every page stays perfectly flat so you can draw, sketch, write smoothly. Coral, matcha tea, kiwi or rosebud? Kraft, baltic sea or sequoia? Rose gold, champagne or olive metallic? We’ve built in even nicer details for you. Designed in Budapest. Printed in Budapest. Bound in Budapest. Managed in Budapest. The notebook is designed in line with Dieter Rams’s 10 principles of good design. Not too large. Not too small. Not too thin. Not too thick. Just the perfect size for your hand and your bag. The historical and the newest bridges as well as 17 sights presented on the 32 pages centre seam. Today’s materials, today’s technologies, today’s appearance - for today’s Van Goghs and Cézannes. The fine touch Munken Pure paper from Sweden is pleasing to your eyes and your touch. We love Budapest and notebooks, so we created a notebook where the city’s sights will accompany you on your way. Take a walk in the city, discover new things, smile on a stranger, grab a bite, have a nice cup of coffee and visit one of the following stores to buy a Hello Budapest notebook. The grid layout of the notebooks is perfect for Bullet Journal customizable organization system. New editions and other product news directly to you mailbox. NOTESS. Custom and special edition premium illustrated eco-design notebooks. BuJo and Bullet Journal are registered trademarks of Lightcage LLC. Copyright © 2019 Hellodesign Bt. All rights reserved. Hellodesign Bt., H-1026 Budapest, Nyúl utca 18.